Percy Mahendra Rajapaksa (Sinhala: මහින්ද රාජපක්ෂ, Tamil: மஹிந்த ராஜபக்ஷ; born 18 November 1945) is a Sri Lankan politician serving as Leader of the Opposition since 2018, and has served as Member of Parliament (MP) for Kurunegala since 2015. He served as the President of Sri Lanka and Leader of the Sri Lanka Freedom Party from 2005 to 2015. A lawyer by profession, Rajapaksa was first elected to the Parliament of Sri Lanka in 1970, and he served as Prime Minister from 6 April 2004 until his victory in the 2005 presidential election. He was sworn in for his first six-year term as president on 19 November 2005. He was re-elected for a second term on 27 January 2010. He was defeated in his bid for a third term in the 2015 presidential election by Maithripala Sirisena and left office on 9 January 2015. Several months after leaving office, Rajapaksa unsuccessfully sought to become Prime Minister in the 2015 parliamentary election, where the United People's Freedom Alliance was defeated. He was, however, elected as Member of Parliament for Kurunegala District. On the 26 October 2018, Rajapaksa was appointed as Prime Minister by President Maithripala Sirisena after the United People's Freedom Alliance withdrew from the unity government. Incumbent Prime Minister Ranil Wickremesinghe refused to accept the dismissal stating that it was unconstitutional, resulting in a constitutional crisis. Two no-confidence motions brought against Rajapaksa was passed by the Sri Lankan Parliament on 14 and 16 November 2018. Both were rejected by President Sirisena stating that proper procedures were not followed. On 3 December 2018, a court suspended Rajapaksa's powers as Prime Minister and ruled that his cabinet could not function until its legitimacy was established. Rajapakse resigned as Prime Minister on 15 December 2018, with Ranil Wickremesinghe re-appointed as Prime Minister, and Rajapaksa appointed Leader of the Opposition. Mahinda Rajapaksa was born in Weeraketiya in the southern rural district of Hambantota. He hails from a well-known political family in Sri Lanka. His father, D. A. Rajapaksa, was a prominent politician, independence agitator, Member of Parliament and Cabinet Minister of Agriculture and Land in Wijeyananda Dahanayake's government. D. M. Rajapaksa, his uncle, was a State Councillor for Hambantota in the 1930s who started wearing the earthy brown shawl to represent kurakkan (finger millet) cultivated by the people of his area, whose cause he championed throughout his life. It is from his example that Rajapaksa wears his characteristic shawl. Rajapaksa was educated at Richmond College in Galle, before moving to Nalanda College in Colombo and, later, Thurstan College. Mahinda Rajapaksa was presented with the Nalanda Keerthi Sri award in 2004 by his alma mater, Nalanda College. He has also appeared in the Sinhalese film Nomiyena Minisun in 1994 and worked as a library assistant at Vidyodaya University. Later he studied law at the Sri Lanka Law College and took oaths as an attorney-at-law in November 1977. Throughout his parliamentary career, except for the period from 1994–2001 when he was a minister, he continued his law practice in Tangalle. In 1983 Rajapaksa married Shiranthi Wickremasinghe, a child-psychologist and educator. Shiranthi Rajapaksa is the daughter of E. P. Wickramasinghe, a retired Commodore of the Sri Lanka Navy. The Rajapaksas have three sons, Namal, Yoshitha and Rohitha. In April 2010 Namal Rajapaksa was elected as a Member of Parliament for the Hambantota District, obtaining the highest number of preferential votes in his father's former district. Namal was again selected for the parliament by obtaining highest votes from Hambantota district in 2015 General Elections as well. Yoshitha was commissioned as an Acting Sub Lieutenant in the Sri Lanka Navy in March 2009. A number of members of Rajapaksa's family are currently active in politics. One brother, Gotabhaya Rajapaksa a former military officer who served in the Sri Lanka Army for 20 years is the former secretary of the Ministry of Defense until Mahinda Rajapakse's presidency was over on 9 January 2015. Another brother, Basil Rajapaksa, was elected to the Parliament of Sri Lanka from the Gampaha District obtaining the largest number of votes by any candidate in the April 2010 general election, and was appointed Minister of Economic Development. Basil was arrested in April 2015 for many corruptions. His eldest brother Chamal Rajapaksa has been a Member of Parliament since 1989, and was elected Speaker of the 14th Parliament of Sri Lanka. Currently Chamal is a member of the parliament. Other family members involved in politics include his nephew, Shashindra Rajapaksa, who was the Chief Minister of the Uva Province. Shameendra Rajapaksa (second son of Chamal Rajapaksa), Director SriLankan Airlines, his cousins Jaliya Wickramasuriya, Sri Lanka's ambassador to the United States, Udayanga Weeratunga, Sri Lanka's ambassador to Russia, Prasanna Wickramasuriya, Chairman Airport & Aviation Services Limited Sri Lanka and Rajapaksa's brother-in-law Nishantha Wickramasinghe is the Chairman of SriLankan Airlines. Rajapaksa is known to be superstitious and wears talismans and consults astrologers in his decision-making. He is known for acquiring a large number valuable rings as lucky charms, some with coloured stones and elephant hair and earned the reputation as a "Lord of rings". During a wedding he attended as a VIP guest he lost a gem-studded ring which was recovered after his security and hotel staff found the ring fallen near a VIP table after covertly searching under carpets and the washrooms. Following the death of his father in 1967, Rajapaksa took over as the SLFP candidate for the Beliatta constituency and was elected to Parliament in 1970 as the youngest Member of Parliament at just 24. Later he studied law at the Sri Lanka Law College and took oaths as an attorney-at-law in November 1977. Losing his parliamentary seat in the landslide defeat of the SLFP in 1977, Rajapaksa was re-elected in 1989 to Parliament to represent Hambantota District under Proportional Representation. He came into prominence as a leader, together with Manorani Saravanamuttu, of the Mothers Front, which organised the mothers of the "disappeared" in the white terror of 1988–90 instigated by a rebel group that called themselves Deshapremi Jathika Vyaparaya or 'Patriotic National Movement'. In 1994, following the election victory of the People's Alliance a political front led by Sri Lanka Freedom Party and headed by Chandrika Kumaratunga, Rajapaksa was appointed Minister of Labour. He held this post until 1997 when, following a cabinet reshuffle, his portfolio was changed to Minister of Fisheries and Aquatic Resources. When the United National Party (UNP) defeated the People's Alliance in the 2001 elections, Rajapaksa lost his position in the Government. He was however appointed as Leader of the Opposition in March 2002. After the Parliamentary Elections of 2004, in which the United People's Freedom Alliance gained a slim majority in Parliament. Rajapaksa was sworn in as Sri Lanka's 13th Prime Minister on 6 April 2004. While Rajapaksa was the Prime Minister, he also held the Ministry of Highways. Mahinda Rajapaksa was chosen by Sri Lanka Freedom Party to contest with former Prime Minister and Opposition Leader, Ranil Wickremesinghe, the leader of the United National Party in this Presidential Election held on 17 November 2005. Despite the huge election campaign led by UNP, Mahinda Rajapaksa was able to gain a narrow victory by 190,000 votes. The Opposition claimed that LTTE calling for a boycott of the polls in the North and East from Tamil voters in areas within their control lead to their defeat. Most voters in these areas were forcibly restrained from voting, and it is said that they would have favored Ranil Wickremasinghe and his UNP party in the said election. Rajapaksa received 50.3% of the vote. After becoming President of Sri Lanka, Rajapaksa reshuffled the cabinet and took the portfolios of Defence and Finance in the new cabinet, which was sworn on 23 November 2005. Immediately following his election in 2005, Rajapaksa extended the term of the Commander of the Sri Lanka Army Sarath Fonseka, less than 30 days before he was scheduled to retire. Over the next three and a half years Fonseka and Rajapaksa's brother and Defense Secretary Gotabhaya Rajapaksa led the country's armed forces in their battle against the LTTE, ultimately defeating the Tigers and killing their leader Velupillai Prabhakaran. Although styling himself as a man of peace and a willing negotiator, Rajapaksa signaled his intention to end the peace process once in power by forging an alliance with the Sinhalese nationalist Janatha Vimukthi Peramuna and the Jathika Hela Urumaya. The JVP had opposed the original 2002 peace process as treasonous. The agreement made with Rajapaksa included provisions which called for a revision of the ceasefire agreement to give the military broader powers against the LTTE, as well as ruling out of any devolution of power to the Tamil people. Furthermore, the cessation of aid to the tsunami struck LTTE occupied areas, and the sidelining of the Norwegian facilitators due to their alleged bias were included. Immediately following his election victory, a series of mine blasts blamed on the LTTE in the country claimed the lives of many off-duty servicemen and civilians, pushing the country back to the brink of war. Following the closure by the LTTE of a reservoir supplying water to 15,000 people named "Mavil Aru" in government controlled areas on 21 July 2006, the Sri Lankan military launched an offensive against the LTTE, bringing the entire reservoir under government control. Further military engagements have led to the LTTE been driven out of the entire Eastern Province of Sri Lanka and loss of 95% of the territory they controlled. The Sri Lanka government declared total victory on 18 May 2009. on 19 May 2009 President Mahinda Rajapaksa delivered a victory address to the Parliament and declared that Sri Lanka is liberated from terrorism. WikiLeaks made public secret US cables (Contents of the United States diplomatic cables leak (Sri Lanka)) from 2009–10, stating that American diplomats including Patricia A. Butenis believed that Mahinda Rajapaksa was responsible for the massacres of Tamil civilians and captured LTTE fighters at the end of the war with the LTTE. The cable also states the responsibility for many of the alleged crimes rests with the country's senior civilian and military leadership, including President Rajapaksa, his brothers and General Fonseka. In April 2011, Ban Ki-moon published a report by a UN-appointed panel of experts, which concluded that as many as 40,000 people were killed in the final weeks of the war between the Tamil Tigers and government forces. A number of foreign journalists and news teams, such as the UK's Channel Four News, have reported and filmed evidence of targeted shelling of civilians, executions and atrocities. Dead female Tamil fighters appeared to have been raped or sexually assaulted, abused and murdered. For their part, Rajapaksa and his government have denied all allegations of war crimes. Former Sri Lankan Army chief Sarath Fonseka was later prosecuted for an interview which he gave to Frederica Jansz, editor of the Sunday Leader, in which he is stated to have said that he is aware of a rumor that surrendering LTTE fighters were executed on the orders of Defence Secretary at the time, Gotabaya Rajapaksa. Following the end of the conflict, a rift emerged between Rajapaksa and Fonseka, over reasons which are still disputed. On 15 November 2009, Rajapaksa ordered Fonseka to leave his post as Chief of the Defence Staff with immediate effect through a letter from his secretary. Fonseka then joined opposition as the candidate against Rajapaksa in the 2010 Presidential election, at which Rajapaksa emerged victory. Fonseka was subsequently sentenced to two years in jail for various offenses by a military court martial. President Rajapaksa signed the order documents for the release of Fonseka in May 2012. His presidency after ending the Civil war in 2009 is known for the initiating the large scale infrastructure projects such as the, Colombo Lotus Tower, Magampura Mahinda Rajapaksa Port, Colombo Harbour South Container Terminal, Mattala Rajapaksa International Airport, Colombo – Katunayake Expressway, Mahinda Rajapaksa International Cricket Stadium. Sri Lanka also made it into the "high" category of the Human Development Index during this time. Initiating, completing and development of many Highways, Roads, Colombo beautification project, Rural infrastructure development projects are some several major projects. However the roadways are known for extremely high costs and is suspected of corruption and the large amount of Chinese loans tripled the countries foreign debt and created an economic crisis. Rajapaksa claimed that under him Sri Lanka started to experienced a rapid economic growth and the GDP growth rate reached over 7% However this has been disputed and after his fall the successor government revealed that GDP growth was inflated by using the year 2002 as the base year; which is usually revised once in five years. GDP growth for 2013 and 2014 which was 7.2% and 7.4% using 2002 as base year was reduced to 3.4 and 4.5 percent respectively. Rajapaksa has been accused of election fraud for both his previous presidential election runs. During the 2005 presidential election, opposition parties accused Rajapaksa of bribing LTTE to avoid people from voting in the Northern and Eastern provinces. Most voters in these areas were forcibly restrained by the militant group from voting, and it is said[by whom?] that they would have favoured opposition candidate Ranil Wickremasinghe. In the 2010 election, Rajapaksa was accused of manipulating election results using computers. In the 2015 election, according to the Presidential Commission of Inquiry investigating irregularities into SriLankan Airlines, it was revealed that Security officers and vehicles of the national carrier had been used in the 2015 presidential campaign of Mahinda Rajapaksa. At the time Nishantha Wickramasinghe, a brother-in-law of Rajapaksa, was also Chairman of SriLankan Airlines until Rajapaksa lost the presidential election in 2015. Capitalising on the end of the Sri Lankan Civil War in May 2009 and coming off an election win in January 2010 and with the near-collapse of the opposition United National Party, President Mahinda Rajapaksa rallied more than the two-thirds majority in Parliament necessary to pass an amendment to the constitution removing presidential term limits. On the 9th September 2010 the Parliament passed the amendment to remove presidential term limits from the Constitution. This amendment allowed Rajapaksa to run for a third term and cement his grip on power. The move came just a day after the Supreme Court ruled that a referendum was not required to make the change. The amendment had even more even more far-reaching consequences than just term limits, including provisions that increased the president's power to act without oversight removing an independent advisory council that the president currently must consult before appointing people to important nonpartisan posts, like Supreme Court judges and members of the human rights and electoral commissions. A Parliamentary Council without veto power and with only two opposition members was created in its place. In a move that was widely seen as solidifying his control over the Supreme Court, Rajapaksa removed chief justice Shirani Bandaranayake from office in January 2013, allowing him to appoint an ally and legal adviser, former Attorney General Mohan Peiris, as Chief Justice. In November 2014 the Supreme Court dismissed legal concerns about President Rajapaksa's eligibility to seek a third term. Two years ahead of schedule, in November 2014, Rajapaksa signed an official proclamation confirming that he will seek re-election for a third term, after being unanimously endorsed by his Sri Lanka Freedom Party. The first time any Sri Lankan President has ever done so. Though his second term officially was to ends in November 2016, he could legally seek re-election after completing four years in office, a marker his office said he passed on November 19. In the run up to the election being called several names had been suggested for nomination as the common opposition candidate: former president Chandrika Kumaratunga, UNP leader Ranil Wickremesinghe, UNP Leadership Council Chairman Karu Jayasuriya, former Chief Justice Shirani Bandaranayake and leader of the National Movement for Social Justice Maduluwawe Sobitha Thero. However, on 21 November 2014, after the election had been called, Maithripala Sirisena, was revealed as the common opposition candidate by the UNP. Sirisena had been Minister of Health in Rajapaksa's government and general secretary of the SLFP before defecting to the opposition coalition. Sirisena immediately received the support of former president Chandrika Kumaratunga and several UPFA MPs that had defected alongside him (Duminda Dissanayake, M. K. D. S. Gunawardena, Wasantha Senanayake, Rajitha Senaratne, Rajiva Wijesinha). Sirisena and the other UPFA MPs were stripped of their ministerial positions and expelled from the SLFP. Rajapaksa received the backing of a number of small constituent parties of the UPFA including the Ceylon Workers' Congress, Communist Party, Lanka Sama Samaja Party (LSSP), National Freedom Front, National Union of Workers and the Up-Country People's Front. On nomination day, 8 December 2014, two opposition MPs, Tissa Attanayake and Jayantha Ketagoda, defected to the government to support Rajapaksa. Attanayake was later appointed Minister of Health — the post previously held by Sirisena. Rajapaksa also received support from the Buddhist extremist Bodu Bala Sena group. However, the Jathika Hela Urumaya (JHU) withdrew from UPFA government on 18 November 2014 citing Rajapaksa's refusal to reform the executive presidency and enact reforms to promote accountability. After much hesitation the All Ceylon Muslim Congress and Sri Lanka Muslim Congress also withdrew from the UPFA government, on 22 and 28 December 2014 respectively, blaming the government's failure to protect Sri Lankan Muslims from Sinhalese Buddhist extremists. Rajapaksa released his manifesto, titled Mahinda's Vision — The World Winning Path, on 23 December 2014 at the Bandaranaike Memorial International Conference Hall. The manifesto pledges to introduce a new constitution within one year of being elected but the executive presidency won't be abolished — it will be amended and the "weakness" in the parliamentary system eliminated. A naval force and a special security force will be set up, with the help of the army, to tackle drug trafficking and other organised crime. The manifesto also pledges to establish a transparent, judicial inquiry into the alleged war crimes during the final stages of the Sri Lankan Civil War but Rajapaksa had refused to co-operate with UN investigation. 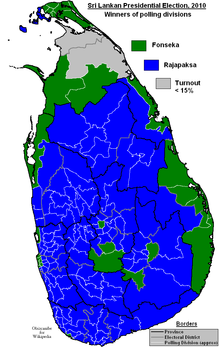 In the Presidential Election of 8 January 2015, Rajapaksa was defeated by his ex-aide Maithripala Sirisena, winning only 47.6% of the vote. Many had accused him of authoritarianism, nepotism, poor governance, and corruption. In June 2018 The New York Times reported that President Rajapaksa, during the 2015 presidential campaign and elections received large payments from the Chinese port construction fund that flowed directly into campaign aides and activities. Rajapaksa had agreed to Chinese terms and was seen as an important ally in China’s efforts to tilt influence away from India in South Asia. The payments were confirmed by documents and cash checks detailed in a government investigation seen by The New York Times. During the final months of the election, the ambassador of China to Sri Lanka had lobbied voters, "even caddies at Colombo’s premier golf course", to support Rajapaksa over the opposition, which was threatening to tear up economic agreements with the Chinese government. With the election coming around large payments started to flow toward the president's circle. Affiliates of Rajapaksa's campaign received at least $7.6 million that was dispensed from China Harbor's account at Standard Chartered Bank. A sum around $3.7 million was distributed in checks with 10 days to go before polls opened: $678,000 to print campaign T-shirts and other promotional material and $297,000 to buy supporters gifts, including women's saris. $38,000 was paid to a popular Buddhist monk who was supporting the Rajapaksa campaign, while two checks totaling $1.7 million were delivered by volunteers to Temple Trees. A sub-account controlled by China Harbor, named “HPDP Phase 2,” shorthand for Hambantota Port Development Project was where most of the payments came from. Rajapaksa responded in the Colombo Telegraph by calling the article "part of a political mudslinging campaign". In July 2018 Joint Chinese-Sri Lankan company Colombo International Container Terminals Limited (CICT) confirmed paying nearly 20 million Sri Lankan rupees as a donation to the Pushpa Rajapaksa Foundation, a private fund meant to build houses for the poor. Pushpa Rajapaksa is Mahinda Rajapaksa's sister in law, wife of Basil Rajapaksa, who was also his economic development minister. CICT did not say how the money was used. According to Athuraliye Rathana Thero, Rajapaksa attempted a coup d'état hours after the announcement of the election result, in order to remain in power, but the Army Chief, Jagath Jayasuriya, disobeyed the orders. According to MPs Rajitha Senaratne and Mangala Samaraweera, before going to the Army Chief, Rajapaksa had earlier instructed the Attorney General to prepare the necessary documentation for the issuance of a State of Emergency but the Attorney General refused. Rajapaksa subsequently accepted defeat and left the Temple Trees, the official residence of president, with the control of the government peacefully transferring to Maithripala Sirisena. The Sirisena government launched a probe into the alleged coup by Rajapaksa. The government argued that Rajapaksa attempted to seize the poll-counting centers when Rajapaksa realised that he was losing the election. One of the witnesses, the Attorney General, admitted to Criminal Investigation Department the coup attempt made by Rajapaksa. Fortunately, the Attorney General refused to act on behalf of Rajapaksa and many believe the story of an attempt is accurate after Attorney General orders an investigation into this coup. Former army chief General Sarath Fonseka claims that the Rajapaksa has moved nearly around 2,000 troops into Colombo from Northern Province three days before the election results were announced. The general claimed that the troops were ready take action on coup. However the cabinet spokesperson of the new government stated, during a press conference held on 24 March 2015, that there was no evidence to prove that such a coup was attempted during the night of the election. A spokesman for Rajapaksa has denied the allegations as baseless. The army and police have also denied the allegations. Mahinda Rajapaksa unsuccessfully sought to become Prime Minister again, after losing his third term presidential bid, in the 2015 parliamentary elections. The position of Prime Minister is largely that of a senior member of the cabinet who acts as deputy to the President. The Prime Minister is directly appointed by the President "who, in the President’s opinion, is most likely to command the confidence of Parliament," usually the leader of the party in power. Rajapaksa, although elected as a Member of Parliament for Kurunegala with 423,529 preferential votes, his party was defeated in the election by Ranil Wickramasinghe's United National Party and appointed as Prime Minister. Rajapaksa returned to parliament after his tenure as president, the only former president to do so. He was elected as Member of Parliament for Kurunegala District. Rajapaksa is being investigated by the Presidential Commission of Inquiry to Investigate and Inquire into Serious Acts of Fraud, Corruption and Abuse of Power, State Resources and Privileges (PRECIFAC) over alleged financial losses caused to the state-run Independent Television Network (ITN) due to the failure to pay for advertisements broadcast during Rajapaksa's 2015 presidential election campaign and also over the appointment of the ITN Chairman in September 2014. However, Rajapaksa has accused the PRECIFAC of being unconstitutional and Rajapaksa's lawyers objected on its composition. In 2016, Rajapaksa loyalists created the Sri Lanka Podujana Peramuna in attempt to split with the SLFP. While Rajapaksa is not officially the leader of the party the inaugural meeting was held in Rajapaksa's political office which had a 15 ft cut out of Rajapaksa smiling and surrounded by school children. In the courtyard was a banner of similar size with golden rice fields and Rajapaksa's smiling visage at its centre. Rajapaksa adopted a more anti-China policy opposing major development projects such as the Southern Economic Development Zone in which China planned to invest over US$5 billion. During the opening ceremony protesters led by Joint opposition MPs ignored a court order banning protests in the area and pelted stones at the event in which the Chinese envoy claimed that China will ignore "Negative forces". He also changed his stance on private medical universities such as the South Asian Institute of Technology and Medicine (SAITM), during his rule SAITM was accepted with several concessions from the Board of Investment and SAITM gave scholarships for students that gained 3As in Advanced level exams but failed to go to public universities at the request of Rajapaksa and ten students were given each given Rs.7 million scholarships by Rajapaksa himself. However, in 2017 he claimed "There needs to be a standard. The law cannot interfere. If it happens, everyone in this country will try to become doctors", opposing the institution. In reply Dr. Neville Fernando, the chairman of SAITM, called him an opportunist as the same students Rajapaksa granted scholarships are now in their final year. Mahinda Rajapaksa's proxy Sri Lanka Podujana Peramuna won a landslide victory in the 2018 local authority elections. They were able to secure staggering 239 Local Government bodies out of 340. The SLPP have called for the resignation of the government and for fresh general elections to be held. In the evening of 26 October 2018, President Maithripala Sirisena appointed Mahinda Rajapaksa as Prime Minister after the United People's Freedom Alliance withdrew from the unity government and informed Ranil Wickremesinghe was removed from office. Wickremesinghe refused to accept the dismissal stating that it was unconstitutional, which resulted in the 2018 Sri Lankan constitutional crisis. Amid claims that Rajapaksa failed to secure a majority in parliament while it was prolonged, Sirisena dissolved Parliament by proclamation on 9 November and called for snap elections. On November 11, 2018, Rajapaksa left the SLFP and joined the SLPP.. The President's proclamation was challenged in the Supreme Court by multiple petitions and the court stayed the proclamation on 12 November and the Parliament met soon after. Rajapaksa faced multiple no-confidence motions and after a quo warranto writ petition filed by 122 MPs against the appointment of Rajapaksa as Prime Minister and other Ministers, the Court of Appeal issued an interim order on 3 December restraining the functioning of the respondents Mahinda Rajapaksa as Prime Minister as well as other cabinet ministers, deputy ministers and state ministers. The following day Rajapaksa filed an appeal in the Supreme Court against the interim order. On 13 December 2018, the Supreme Court ruled that President Sirisena's decision to dissolve the Parliament 20 months before the end of its term was unconstitutional. The following day, the Supreme Court refused to vacate the interim order given by the Court of Appeal restraining Rajapaksa and his cabinet from functioning. The next day 15 December, Rajapaksa publicly resigned from the post of prime minister at his official residence. On 18 December 2018, the Speaker of Parliament, Karu Jayasuriya informed that Mahinda Rajapaksa had been appointed as Leader of the Opposition with the UPFA joining the opposition benches in parliament. He replaced R. Sampanthan who was the leader of the Tamil National Alliance. Mahinda Rajapaksa government have been criticized for its corruption. During his leadership Sri Lanka scored extremely low in the Transparency International Corruption Index. A Transparency International-led coalition revealed Rs. 3,000,000,000 had gone missing from a roading project for a 2012 exhibition. On 16 January 2015, The Sirisena government announced that it would investigate Rajapaksa's deals with China and other countries that alleging included kickbacks and the mega projects deals. Furthermore, the government stated that the deals would be suspended until the investigation is completed. Janatha Vimukthi Peramuna (JVP) announced that they had filed corruption charges against the Rajapaksa brothers at the Bribery and Corruption Commission and demanding that 11 individuals and an institution be investigated for massive corruption. Meanwhile, Mervyn Silva also filed corruption charges his brothers Gotabaya Rajapaksa and Basil Rajapaksa. Silva criticised that former Defence Secretary Gotabaya Rajapaksa for the white van culture and the death of Lasantha Wickrematunge. The Sri Lanka Air Force announced that Mahinda Rajapaksa and family used the military aircraft for the Presidential election campaign that cost $17,273.28 (Rs. 2,278,000.00) of public fund to travel across island. Rajapaksa and family received numerous of state resource abuse complaint from organisations and election monitors including on their involvement in fraud, misuse of powers and murder – prior to their fraudulent cases are money laundering that said to have taken $5.31 billion (Rs. 700 billion) out of country illegally through Central Bank using Rajapaksa's close association Ajith Nivard Cabraal the former governor of Central Bank of Sri Lanka. On 23 January 2015, The Seychelles government announced that would assist Sri Lankan government in search of funds that were allegedly transferred by Rajapaksa regime into Port Victoria offshore bank accounts. Earlier month of February, India announced that it would assist the Sri Lankan government in tracing the billion of dollars funds that were allegedly deposited to oversea bank accounts of Rajapaksa and the association. Instantly the government sought help from the World Bank and the International Monetary Fund in locating this hidden wealth to expose the alleged corruption of the previous regime. Anti-Corruption Unit led by Prime Minister Ranil Wickremesinghe, the new Cabinet has appointed a high-powered "rapid response team" to look into corrupt land transactions, stock market price-fixing and the abuse of state funds for political purposes by Rajapaksa family and the close association of Mahinda Rajapaksa. On 7 May 2015, Foreign Minister Mangala Samaraweera received intelligence reports from four foreign nations that involved in tracing the billions of Dollars stashed aboard, stating that the Rajapaksa family holds $18 Billion (approximate Rs. 237,933,000,000) worth of assets in foreign countries. Minister Samaraweera didn't mention the names of countries that is involved in this investigation. The government asserted that they have only traced the $2 Billion and the government is seeking an access to the bank account that is held by the Rajapaksa family, However Minister Samaraweera stated this will not be easy task to retrieve entire assets held by the Rajapaksa family aboard and are willing to go after these assets that were stashed illegally aboard belonging to the State. It is believed that Rajapaksa has a long history of denying 'allegations' that were levelled against his family members and political associations. He is also widely accused on using his family members for government duties, which later he 'rejected' these claims. in August 2018 Rajapaksa was questioned at his official residence in Colombo by the Criminal Investigations Department (CID) in connection to the abduction and assault of journalist and former Associate Editor of The Nation Keith Noyahr in 2008. The CID detectives questioned Rajapaksa about a phone call from Karu Jayasuriya and the then Editor of The Nation newspaper Lalith Alahakoon to Rajapaksa after which to Noyahrs was released. Rajapaksa had said he did not recall receiving a phone call, and claimed the case as political revenge. Noyahr was abducted and severely assaulted before being released in May 2008, after which he fled to Australia with his family fearing for his life. Mahinda Rajapaksa has been accused of nepotism, appointing three brothers to run important ministries and other political positions for relatives, regardless of their merit. The Rajapaksas held the offices of the ministries of Defence finance, defence, ports and aviation, highways and road development public works. This includes his brother Gotabhaya Rajapaksa, who was given the post of Defence Secretary, without holding any elections for the post. He also controlled the armed forces, the police and the Coast Guard, he was in charge of immigration and emigration. Rajapaksa appointed his brothers Basil Rajapaksa as minister of Economic Development. His oldest brother, Chamal Rajapaksa, was appointed the Speaker of the Parliament of Sri Lanka from 2010 to 2015, and has held many[which?] other posts before. The Rajapakse family controlled over 70% of Sri Lanka's budget during their governance. Others includes his nephew, Shashindra Rajapaksa, who served as the Chief minister of Uva from 2009 to 2015. Some of his cousins were given ambassadorial positions: Jaliya Wickramasuriya was appointed as Sri Lanka's ambassador to the United States, as well as Udayanga Weeratunga, who was appointed the ambassador to Russia. Dozens of nephews, nieces, cousins and in-laws have also been appointed as heads of banks, boards and corporations. Media groups have alleged that media freedom has been curtailed in Sri Lanka during Rajapaksa's term as president. In 2008 Reporters Without Borders ranked Sri Lanka 165th among 173 countries in its annual Worldwide Press Freedom Index. The next year, the country was ranked 162. By 2010, following the end of the war, the RSF ranking was 158th. However, these ranking have been questioned by independent Sri Lanka newspapers. A total of 17 journalists and media workers were killed during Rajapakse's presidency. The content of the President's historic speech in Tamil at the UN was an effort to establish that he is a people's leader representing all the peoples of Sri Lanka, including the Tamil minority. While my mother tongue is Sinhala, let me elaborate a few thoughts in Tamil. Sinhala and Tamil are the two languages of the people of Sri Lanka. Both these have been used through the centuries, are rich in literature, and are widely used in my country, with recognition as Official Languages. With the widening of democracy in our country, the bonds between the Sinhala and Tamil people of Sri Lanka will grow stronger and remain a major force for its future development. We will march towards a richer freedom and lasting unity that await us as a nation. However he lost the support of minorities due to his inaction to Sinhala Buddhist extremist attacks minorities and his brother Gotabhaya Rajapaksa was seen supporting the extremist Bodu Bala Sena However he changed the stance and claimed that BBS was a "western conspiracy" even though his brother even opened a BBS office in Galle. He also imposed an unofficial ban of the Tamil version of the Sri Lankan anthem which existed since 1948 and has been sung in various events including 1949 independence day. State administrators in the Tamil speaking regions blocked the Tamil version of the anthem in fear, School children in Tamil speaking north were forced to sing the anthem only in Sinhala version and in some cases the army barged into civil events when the Tamil version of the anthem was sung. He continued to stand against the Tamil version of the anthem and slammed his successors for removing the ban and singing it again in the Independence day, claiming "National anthem should be sung in one language and not two or three languages", and the Pro-Rajapaksa Joint Opposition also boycotted the event. Rajapaksa considered as most popular Sri Lankan politician during his time. Rajapaksa also accused of creating a cult of personality around him using the war victory and Sinhala Chauvinism. He was referred as a "King" by some of his supporters and used the media to portray himself as a strong man During his time in power his pictures were shown in buses, billboards and all forms of media. Television ads where songs were sung by school children in his rallies would hail him as "our father" and "father of the country". Rajapaksa also printed his picture on currency notes and named the budget airline Mihin Lanka after himself. Rajapaksa thought having his name in the sky would bring him good fortune.Mattala Rajapaksa International Airport, Magampura Mahinda Rajapaksa Port, Nelum Pokuna Mahinda Rajapaksa Theatre and Mahinda Rajapaksa International Stadium were all high-profile lavish infrastructure projects initiated by Rajapaksa during his administration and named after him. Due to these critics including psychiatrists have further accused him of having Narcissistic personality disorder citing these alongside the 18th amendment and claims by his loyalists that Rajapaksa is related to King Dutugamunu and through him to Buddha show his grandiose sense of self-importance, need of excessive admiration and fantasies of excessive power and his treatment of Shirani Bandaranayke and Sarath Fonseka was cited as evidence of his lack of empathy. Critics also pointed that organizing post presidential election rallies with his supporters instead of retiring was also considered a source of Narcissistic supply. He was conferred with two Honorary Doctorates. The first one is a Doctor of Law from the University of Colombo on 6 September 2009. The second degree was awarded by the Peoples’ Friendship University of Russia on 6 February 2010 for his contribution for world peace and outstanding success in defeating terrorism. He was also awarded an Honorary Doctorate by the Peoples’ Friendship University of the Russian Federation in February 2010 at its 50th anniversary celebrations. The Visva Bharati University of Calcutta in India conferred on him the title Professor Emeritus for his record on human rights. President Mahinda Rajapaksa was conferred with an Honorary Doctorate by the Beijing University of Foreign Languages in China in August 2011. ^ No-confidence motion passed on 14 November 2018. ^ Functions and duties as PM suspended by a court on 3 December 2018. ^ "Mahinda Rajapakse". Encyclopaedia Britannica. Retrieved 9 August 2017. ^ "On December 3, 2018, Sri Lanka temporarily bars Mahinda Rajapaksa from acting as PM". ^ "(BBC)". BBC News. 27 January 2010. Retrieved 28 September 2012. ^ a b c "Sri Lanka election: Mahinda Rajapaksa concedes he is unlikely to be PM". The Guardian. 18 August 2015. ISSN 0261-3077. Retrieved 2 September 2015. ^ "President says no to second NCM". ^ "Mahinda Rajapaksa Cannot Take Actions As Sri Lanka PM, Says Court". ^ "Sri Lanka parliament passes no-confidence motion against Mahinda Rajapaksa". Hindustan Times. 14 November 2018. ^ "Mahinda Rajapaksa". Imdb. Retrieved 17 August 2018. ^ "First Lady of Sri Lanka". Dailynews.lk. 26 February 2006. Archived from the original on 8 October 2012. Retrieved 28 September 2012. ^ "His Excellency the President Chief Guest at the Commissioning Parade held at the Naval and Maritime Academy". Navy.lk. Archived from the original on 27 October 2012. Retrieved 28 September 2012. ^ "Sri Lanka: a country ruled as a family business by four brothers". The Telegraph (UK). Retrieved 17 October 2013. ^ 11 November 2010 (11 November 2010). "Asia Times Online :: South Asia news, business and economy from India and Pakistan". Atimes.com. Retrieved 6 March 2012. ^ A fault in his stars? Mahinda Rajapaksa expected a coronation. Instead he faces a tricky election, economist.com. ^ "economynext.com". www.economynext.com. Retrieved 29 November 2015. ^ "'Lord of the Rings' recovered". www.slguardian.org. Archived from the original on 1 December 2015. Retrieved 29 November 2015. ^ "How Mahinda Rajapaksa Justified Complaining to UNHRC in Geneva in 1990 About Human Rights Violations in Sri Lanka". ^ "Mahinda Rajapaksa went to Geneva frequently during UNP rule and wanted the UN to intervene in Sri Lanka to uphold human rights". Archived from the original on 10 May 2017. ^ "Hardliner wins Sri Lanka election". BBC News. 18 November 2015. ^ "SRI LANKA: Reform and peace at stake in November poll". Oxford Analytica. Archived from the original on 23 November 2009. Retrieved 27 September 2005. ^ "How President decided on retaliation". The Sunday Times. UK. 30 April 2006. ^ "Sri Lanka forces attack reservoir". BBC News. 6 August 2006. ^ "Fighting mars Lanka peace moves". BBC News. 6 October 2006. Retrieved 12 May 2010. ^ "Sri Lanka President swipes at U.N. record". REUTERS. 25 September 2007. ^ "President Mahinda Rajapaksa appeals to unnamed political elements not to betray motherland to foreign interests". Asian Tribune. 13 August 2007. ^ "Sri Lankan TV broadcasts 'video of body of Tamil Tiger leader' as President declares the country liberated from terrorism". Daily Mail. London. 20 May 2009. Retrieved 18 August 2011. ^ Weaver, Matthew; Chamberlain, Gethin (19 May 2009). "Sri Lanka declares end to war with Tamil Tigers". The Guardian. London. Retrieved 18 August 2011. ^ "WikiLeaks: Mahinda Rajapaksa 'responsible for war crimes'". The Daily Telegraph. London. 2 November 2010. ^ "The Sri Lankan soldiers 'whose hearts turned to stone' – Channel 4 News". Channel4.com. 27 July 2011. Retrieved 28 September 2012. ^ "Sri Lanka's Killing Fields – 4oD". Channel 4. Retrieved 28 September 2012. ^ "Sri Lanka News | Online edition of Daily News – Lakehouse Newspapers". Dailynews.lk. 7 December 2010. Archived from the original on 10 December 2010. Retrieved 6 March 2012. ^ Haviland, Charles (16 November 2009). "S Lanka army head leaves abruptly". BBC News. Retrieved 12 May 2010. ^ "Nelum Kuluna constructions, progressing -dailynews.lk". Archived from the original on 6 February 2015. ^ "Thesundayleader.lk -Hambantota Port declared open". ^ "'Rise of the South' – Sri Lanka ranked high in human development". Archived from the original on 2 April 2015. ^ "High roads to highways -dailynews.lk". ^ Iyengar, Rishi. "Sri Lanka Attempts to Repair Relations with China". TIME.com. Retrieved 19 October 2015. ^ "Road building or rip off -sundaytimes.lk". ^ "Sri Lanka moves to a higher growth trajectory to achieve upper middle income status by 2016 – President". ^ "Sri Lanka's GDP dilemma". www.sundaytimes.lk. Retrieved 25 June 2016. ^ "Sri Lanka's revised GDP data after base year change lower economic growth". ^ "IMF TIE-UP FOR FORENSIC AUDITS". Archived from the original on 16 August 2016. ^ "IMF confirms Sri Lanka has additional Rs1.3 trillion liabilities". ^ "Hardliner wins Sri Lanka election". BBC News. 18 November 2005. ^ "Authorship of "Computer Jilmaart" changes". www.adaderana.lk. ^ "SriLankan Airlines assets used in Rajapaksa's presidential campaign". Economynext. Retrieved 17 August 2018. ^ a b Polgreen, Lydia. "Sri Lanka Ends Presidential Term Limits". The New York Times. The New York Times. Retrieved 10 July 2018. ^ Ondaatjie, Anusha (21 November 2014). "Sri Lankan president to face challenge from ally". Chicago Tribune. ^ "Minister defects to challenge Rajapaksa". The Peninsula. Agence France-Presse. 22 November 2014. Archived from the original on 28 June 2015. ^ "Sri Lanka's Rajapakse gets court nod to seek third term". The Malay Mail. Agence France-Presse. 11 November 2014. ^ a b c Bastians, Dharisha; Harris, Gardiner. "Sri Lanka's President to Seek Unprecedented Third Term". The New York Times. Retrieved 10 July 2018. ^ "Extremist Buddhist movement in Sri Lanka says Ranil is the most suitable common candidate". Colombo Page. 19 November 2014. ^ "Who should the opposition field as common candidate at Presidential Election?". Ada Derana. 3 October 2014. Archived from the original on 17 December 2014. Retrieved 10 July 2018. ^ "I'm the common candidate: Maithripala". Daily Mirror. 21 November 2014. Archived from the original on 17 December 2014. ^ Dalima, Bella (21 November 2014). "UNP to extend their support to Maithirpala Sirisena". News First. ^ "Maithiripala Sirisena of SLFP emerges as common opposition candidate contesting Rajapaksa". TamilNet. 21 November 2014. ^ Edirisinghe, Dasun (22 November 2014). "Maithripala promises to scrap presidency within 100 days". The Island (Sri Lanka). ^ "Maithripala named common candidate". The Nation (Sri Lanka). 21 November 2014. Archived from the original on 29 November 2014. ^ Dalima, Bella (21 November 2014). "I am the common candidate: Maithripala Sirisena". News First. ^ "Chandrika, Rajitha, Arjuna, Rajeeva, M K D S and Dumindha Dissanayaka join Maithripala". Hiru News. 21 November 2014. Archived from the original on 21 November 2014. Retrieved 10 July 2018. ^ "SLFP rebels stripped of posts and party membership". The Nation (Sri Lanka). 21 November 2014. Archived from the original on 25 January 2015. ^ "Sri Lanka Presidential Election Set for January 8 Next Year". NDTV. Press Trust of India. 21 November 2014. ^ "Maithripala and others sacked". The Daily Mirror (Sri Lanka). 21 November 2014. ^ "Tamil party to support Rajapaksa in polls". The Hindu. Press Trust of India. 16 October 2014. ^ "Communist Party pledges its support for President Rajapaksa". The Island (Sri Lanka). 13 November 2014. ^ Herath, Anuradha (5 November 2014). "But wants Exec. Presidency abolished". Ceylon Today. ^ "Wimal to back MR". The Daily Mirror (Sri Lanka). 19 October 2014. ^ "NUW pledges support for President Rajapaksa at upcoming elections". News First. 25 October 2014. ^ "Upcountry Tamil party to support President at elections". Daily FT. 11 November 2014. Archived from the original on 28 March 2016. Retrieved 10 July 2018. ^ Edirisinghe, Dasun (9 December 2014). "Tissa, Ketagoda join UPFA". The Island (Sri Lanka). ^ Panchalingam, Ariram (8 December 2014). "Tissa and Ketagoda to support President Mahinda Rajapaksa". News First. ^ "Tissa sworn in as Health Minister". The Daily Mirror (Sri Lanka). 11 December 2014. ^ "Tissa Attanayake sworn in as Minister of Health". The Nation (Sri Lanka). 11 December 2014. Archived from the original on 13 December 2014. ^ Jayakody, Ruwan Laknath (25 December 2014). "BBS pledges support to MR". Ceylon Today. ^ "Buddhist party quits Sri Lanka government". Al Jazeera. 18 November 2014. ^ "Key Rajapaksa ally quits Lanka's ruling coalition". Zee News. Agence France-Presse. 18 November 2014. ^ "Huge crowd at campaign against Ex. Presidency". DailyMirror Sri Lanka. 12 November 2014. ^ Srinivasan, Meera (22 December 2014). "Rajapaksa's Muslim ally defects to opposition". The Hindu. ^ "Sri Lanka's biggest Muslim party ditches Rajapaksa". The Guardian. Associated Press. 28 December 2014. ^ "SLMC to support Sirisena, Hakeem resigns ministerial portfolio". TamilNet. 28 December 2014. ^ "MR launches manifesto". The Daily Mirror (Sri Lanka). 23 December 2014. ^ "Sri Lankan President launches election manifesto". Colombo Page. 23 December 2014. ^ a b "As crucial election nears, main candidates gear up for final lap". The Sunday Times (Sri Lanka). 28 December 2014. ^ "Sri Lankan leader promises reforms to presidency". The New Zealand Herald. Associated Press. 24 December 2014. Archived from the original on 31 December 2014. ^ "Mahinda's Vision – The World Winning Path". mahinda2015.com. p. 17. Archived from the original on 4 March 2016. Retrieved 10 July 2018. ^ "Mahinda's Vision – The World Winning Path". mahinda2015.com. p. 25. Archived from the original on 4 March 2016. Retrieved 10 July 2018. ^ Srinivasan, Meera (23 December 2014). "Ahead of polls, Rajapaksa promises inquiry into war crime allegations". The Hindu. ^ "Sri Lanka's president 'promises' inquiry into death of civilians". The Malay Mail. Agence France-Presse. 23 December 2014. ^ "Mahinda's Vision – The World Winning Path". mahinda2015.com. p. 14. Archived from the original on 4 March 2016. Retrieved 10 July 2018. ^ "Sri Lanka's Rajapaksa suffers shock election defeat". BBC. Retrieved 10 January 2015. ^ "Sirisena dethrones Rajapaksa in Sri Lanka". Khaleej Times. Retrieved 10 January 2015. ^ a b c Abi-Habib, Maria. "How China Got Sri Lanka to Cough Up a Port". The New York Times. Retrieved 10 July 2018. ^ "Chinese funds financed MR's election campaign: NY Times". Daily Mirror. Retrieved 10 July 2018. ^ "China gave $7.6 million to MR's 2015 campaign". News 1st. Retrieved 10 July 2018. ^ Rajapaksa, Mahinda. "On Allegations Made By The New York Times". Colombo Telegraph. Retrieved 17 August 2018. ^ De Alwis, Nathasha. "MR backs down from New York Times legal challenge". News First. Retrieved 17 August 2018. ^ "Sri Lanka: Yes We Gave Money to Rajapaksa — Chinese Firms Confirmed". Sri Lankan Guardian. Retrieved 17 August 2018. ^ ""Army Refused Last Minute Orders To Deploy Troops In Capital City" – Rajitha". AsiaMirror.lk. 10 January 2015. Retrieved 10 January 2015. ^ "Army refused orders to deploy in Colombo- Rajitha". 10 January 2015. Archived from the original on 10 January 2015. Retrieved 10 January 2015. ^ "Rathana Thera Reveals Last Minute Attempt To Stay In Power: "Gota Looked Extremely Worried And Pensive"". AsiaMirror.lk. 10 January 2015. Retrieved 10 January 2015. ^ "Mahinda Concedes, Leaves Temple Trees". Colombo Telegraph. Retrieved 10 January 2015. ^ "Sri Lanka to investigate 'Rajapaksa coup plot'". bbc.com. BBC World. 11 January 2015. Retrieved 12 January 2015. ^ "UNP – UPFA trying to destabilise". DailyMirror.lk. 11 January 2015. ^ "AG tells CID to probe alleged 'coup' plot". adaderana.lk. Retrieved 16 January 2015. ^ "Fonseka claims 2000 troops sent". Colombo Gazette. 16 January 2015. Archived from the original on 18 January 2015. ^ "ජනවාරි 8 දා කුමන්ත්‍රණයක්‌ සිදුවූ බවට තහවුරු වී නෑ". Divaina. 24 March 2015. ^ "Sri Lanka's Rajapaksa 'sought army help after poll defeat'". BBC News. 1 January 2015. ^ Aneez, Shihar (11 January 2015). "Sri Lanka army defied order to keep Mahinda Rajapaksa in power, says aid". The Sydney Morning Herald. ^ Fairclough, Gordon (11 January 2015). "Rajapaksa Sought Help 'By Force,' Opponents Say". The Wall Street Journal. ^ "The Constitution of the Democratic Socialist Republic of Sri Lanka" (PDF). 15 May 2015: 40. Retrieved 10 July 2018. ^ "Rajapaksa Tops Kurunegala Preferential Votes-Updated". www.asianmirror.lk/. Retrieved 4 September 2016. ^ "MR to challenge PRECIFAC's legality". www.ft.lk. Retrieved 19 October 2015. ^ "News view - LankasriNews.com". eng.lankasri.com. Archived from the original on 7 January 2016. Retrieved 19 October 2015. ^ "Podujana Peramuna channels Mahinda, seeks to become the 'true' SLFP". Retrieved 8 January 2017. ^ "China to implement its projects in Sri Lanka ignoring negative forces". The New Indian Express. Retrieved 8 January 2017. ^ "52 arrested in Hambanthota for unruly behaviour; 23 imprisoned". Hiru News. Retrieved 8 January 2017. ^ "Some politicians are opportunists – Dr. Neville". www.adaderana.lk. Retrieved 7 February 2017. ^ "Fmr. President's views on SAITM – a complete contrast in those of the past". Sri Lanka News – Newsfirst | Breaking News and Latest News provider | Political | Sports | International | Business. 6 February 2017. Retrieved 7 February 2017. ^ Aneez, Shihar; Srilal, Ranga (11 February 2018). "Sri Lanka ex-leader-backed party set for landslide victory in local polls". reuters.com. Reuters. Retrieved 11 February 2018. ^ "SLPP wins 239 LG bodies, UNP 41". dailymirror.lk. dailymirror.lk. 11 February 2018. Retrieved 12 February 2018. ^ "Govt. has no option but to resign: JO". dailymirror.lk. Daily Mirror. 11 February 2018. Retrieved 11 February 2018. ^ "SLPP to push for snap General Elections following surprise win". colombogazette.com. Colombo Gazette. 11 February 2018. Retrieved 11 February 2018. ^ "Mahinda Rajapaksa sworn in as Prime Minister". adaderana.lk. 26 October 2018. Retrieved 26 October 2018. ^ "Lanka crisis: Rajapaksa ends association with Sirisena's party, joins newly-formed SLPP". The Times of India. 11 November 2018. Retrieved 22 November 2018. ^ "Interim order against PM, Cabinet". www.dailymirror.lk. Retrieved 15 December 2018. ^ Abi-Habib, Maria; Bastians, Dharisha (14 December 2018). "Sri Lanka's Disputed Prime Minister Will Step Down". The New York Times. Retrieved 16 December 2018. ^ "SC refuses to vacate CA's interim order against MR". www.dailymirror.lk. ^ "MR appointed as Opposition Leader". www.dailymirror.lk. ^ Rutnam, Easwaran. "Sri Lanka Is A Corrupt Nation". Sunday Leader. Retrieved 12 April 2015. ^ "Sri Lanka's new government to investigate Mahinda Rajapaksa corruption allegations". International Business Times. 16 January 2014. ^ "JVP wants corruption probe against Rajapaksa family". 13 January 2015. Retrieved 17 January 2015. ^ "Video: Mervyn goes to CID against Gota and Basil". DailyMirror.lk. Retrieved 17 January 2015. ^ Kannangara, Nirmala (18 January 2015). "Flying High With Public Funds". The Sunder Leader. Retrieved 4 February 2015. ^ ANEEZ, SHIHAR (22 January 2014). "Sri Lanka to probe hidden foreign assets after Rajapaksa defeat". Reuters. Retrieved 4 February 2015. ^ "Sri Lanka's former president Rajapaksa faces graft complaint". The Straits Times. 14 January 2015. Retrieved 4 February 2015. ^ "Seychelles says ties with Sri Lanka go beyond politics, offers to assist investigations". Colombo Page. 23 January 2015. Retrieved 5 February 2015. ^ "India to help SL to trace billions stashed abroad". DailyMirror.lk. 3 February 2015. Retrieved 4 February 2015. ^ a b "India to help Sri Lanka to trace billions stashed abroad by Rajapaksas". Sri Lanka Guardian. 4 February 2015. Retrieved 4 February 2015. ^ "Rajapaksas Siphon Off 18 Billion Dollars: Foreign Minister Mangala Samaraweera". Colombo Telegraph. 7 May 2015. Retrieved 7 May 2015. ^ "Rajapaksas have siphoned off over USD 18 billion, says Mangala". Adaderana.lk. 7 May 2015. Retrieved 7 May 2015. ^ "Nepotism visualised: The Rajapaksa tentacles in Sri Lanka". GroundViews.org. Retrieved 15 June 2015. ^ "CID team leaves MR's residence: Records statement for 3 hour". Retrieved 17 August 2018. ^ "It is political revenge: MR". Daily Mirror. Retrieved 17 August 2018. ^ "CID team in Australia to record Keith Noyahr's statement". Daily Mirror. Retrieved 17 August 2018. ^ "CID questions former President over assault on Keith Noyahr". Colombo Gazette. Retrieved 17 August 2018. ^ "A war strange as fiction". 7 June 2007 – via The Economist. ^ a b Ramachandran, Sudha. "Feuds start in Sri Lanka's first family". www.atimes.com. ^ "An open letter to Sri Lankan journalists". Channel 4.com (UK). Retrieved 17 November 2013. ^ "Reporters Without Borders". Rsf.org. Archived from the original on 10 June 2009. Retrieved 2012-03-06. ^ "Freedom Of Expression In Sri Lanka, Circa 2011 | The Sunday Leader". Thesundayleader.lk. 30 January 2011. Retrieved 6 March 2012. ^ "Sri Lanka's Mahinda Rajapakse Claims "Witch Hunt" Over Journalist Kidnap Probe". NDTV. Agence France-Presse. Retrieved 19 August 2018. ^ "Lanka ex-president claims 'witch hunt' over kidnap probe". Gulf Today. Agence France-Presse. Retrieved 19 August 2018. ^ a b "Address by Mr. Mahinda Rajapaksa, at the 63rd session of the United Nations General Assembly" (PDF). United Nations. ^ "Sri Lanka's Rajapaksa loses minority support ahead of polls". ^ "Bodhu Bala Sena Begins New Campaign Against Attire of Muslim Women in Sri Lanka After Abolishing Halal Logos". ^ "Sri Lanka nationalist BBS a Western conspiracy: Mahinda Rajapaksa". ^ "Sri Lankan President lifts ban on singing national anthem in Tamil". ^ "National anthem was sung in Tamil in 1949 too: Vajira". ^ "Singing the National Anthem in Tamil Hailing "Mother Lanka" as "Sri Lanka Thaaye"". ^ "Mahinda slams decision to sing national anthem in tamil". ^ "Sri Lanka's political crisis: everything you need to know". Retrieved 24 November 2018. ^ "Cult of personality grows around Sri Lanka's leader". Retrieved 16 September 2015. ^ "Reappearance Of Rajapaksa Cult At Nugegoda". Retrieved 16 September 2015. ^ "Is Mahinda Rajapaksa Suffering From The Complex Of "Excessive Self-Love "?". Retrieved 17 September 2015. ^ a b "Name your price". The Economist. Retrieved 25 October 2015. ^ "In Rajapaksa's defeat, a lesson for strongmen in democracies". Hindustantimes. Retrieved 17 September 2015. ^ "A 1000 Rupee Handbill | The Sunday Leader". Retrieved 17 September 2015. ^ "This man built his own vanity international airport…". The Journal. thejournal.ie. Retrieved 25 October 2015. ^ "Is Mahinda Rajapaksa Suffering From The Complex Of "Excessive Self-Love "?". Colombo Telegraph. Retrieved 25 February 2017. ^ "This Picture Of Mahinda Says Thousand Words". Colombo Telegraph. Retrieved 25 February 2017. ^ "Sycophantic gibberish of saying Rajapaksas are descendants of Dutu Gemunu and relatives of Lord Buddha". transcurrents.com. Archived from the original on 26 February 2017. Retrieved 25 February 2017. ^ "Palestine confers highest honor on Sri Lankan President". colombopage. Retrieved 25 October 2015. ^ Gamini Gunaratna, Sri Lanka News Paper by LankaPage.com (LLC)- Latest Hot News from Sri Lanka (6 September 2009). "Sri Lanka : Sri Lanka President and defence secretary conferred honorary doctorates". Colombopage.com. Retrieved 6 March 2012. ^ "Lumumba University honors President Rajapaksa with a Doctorate in Moscow, Russia". Lankaenews.com. Archived from the original on 10 March 2012. Retrieved 28 September 2012. ^ "www.president.gov.lk". president.gov.lk. Retrieved 6 March 2012. ^ a b ":.Profile in Brief". Priu.gov.lk. Retrieved 6 March 2012. ^ "Beijing Language and Culture University". Blcu.edu.cn. Archived from the original on 18 March 2012. Retrieved 6 March 2012.